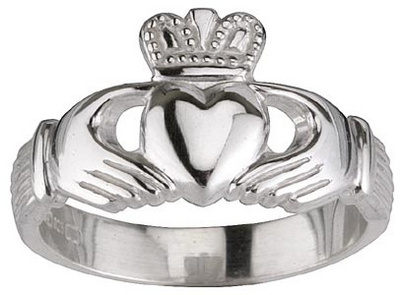 The Traditional Irish love ring is called the claddagh. Two hands, holding tight to a heart, below a crown. What were its surprising origins? Well. The ring was designed by a Galway man, Richard Joyce who was captured by an Algerian corsair while sailing to the West Indies in the 17th century. Next? What else. He was sold into the service of a goldsmith in Algiers. What a trip! Joyce became a terrific goldsmith. William III demanded the Moors release their Brit prisoners. Holy Smoke! The goldsmith offered half of his fortune and his daughter’s hand in marriage if Joyce would stay and become his partner. Thanks, but no thanks. The Galway goldsmith was still in love with his sweetie back home, and when he returned to Claddagh, he gave his honey the ring he’d made for her while he was in Algiers. It’s still traditional to give this ring to the object of your affections, and it’s become, well, almost a cultural symbol, worn by the Irish and those who love Ireland, the world around. Understandable–it is truly a ring of grace, love and beauty.